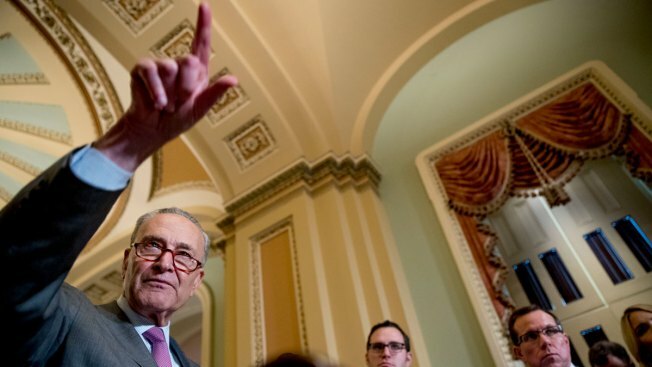 Senate Minority Leader Sen. Chuck Schumer of N.Y., left, takes a question from a reporter following a closed door policy luncheon on Capitol Hill in Washington, Tuesday, June 26, 2018. Politicians on Capitol Hill sounded off Friday on the 12 indictments of Russian intelligence officers in the special counsel's probe, with several top Democrats urging the president to cancel his upcoming meeting with Russia's leader. Senate Minority Leader Chuck Schumer, D-N.Y., said in a statement that the indictments "are further proof of what everyone but the president seems to understand: that (Russian President Vladimir Putin) is an adversary who interfered in our elections to help President Trump win." On Twitter, Schumer wrote: "Cancel the Putin meeting. Now." President Donald Trump is on a week-long, four-nation European tour and has met with NATO officials, British Prime Minister Theresa May and Queen Elizabeth II. Before he left, he had said his meeting with the Russian leader "may be the easiest of them all." Speaking in Britain, Trump said he'll raise the issue of Russian meddling in the election with Putin but doesn't think Putin will say "you got me." While U.S. intelligence agencies have concluded that Russia meddled in the election to try to help Trump get elected, Putin has denied interfering and Trump has also reiterated his denials. Trump added that he'll discuss other issues with Putin, mentioning Ukraine, Syria, other areas of the Middle East and nuclear proliferation. Deputy Attorney General Rod Rosenstein announced the new indictments Friday. Eleven of the officers are accused of hacking computers and stealing and releasing documents to interfere with the election, while the 12th allegedly conspired to infiltrate election administration organizations like boards of elections. Justice Department officials said information on about 500,000 voters was stolen from a state election board; officials didn't say what state. Trump was briefed on the charges earlier this week and the president was aware of Friday's announcement, Rosenstein said. The indictment doesn't contain allegations that the conspiracy managed to change the result of the election, nor does it say any Americans conspired with the Russians, Rosenstein said. Rep. Adam Schiff, ranking member of the House Intelligence Committee, echoed Schumer's call for Trump to nix his sit-down with Putin, saying in a statement that "it is abundantly clear that the President will not confront Putin on the charges laid out in this indictment." "It is in the strong national security interests of the United States for the President to cancel any meeting with Putin," the California Democrat wrote in a statement. "The American people need and deserve a president who stands up to foreign interference and puts the interests of our country first." Democratic Sens. Elizabeth Warren of Massachusetts and Jack Reed of Rhode Island also said Trump should cancel the meeting. Republican Sen. John McCain said the president "must be willing to confront Putin" on the his country's alleged attacks on the U.S. election. "If President Trump is not prepared to hold Putin accountable," McCain added in a statement, "the summit in Helsinki should not move forward." House Speaker Paul Ryan, R-Wis., said through a spokesperson that he's "glad these hackers are being held to account." "We've said all along we know Russia meddled in our elections," he said. "The U.S. intelligence community knows that the Russian government attacked the U.S. This is not a Republican or a Democrat view -- it is simply the reality," tweeted Republican Sen. Ben Sasse of Nebraska. "All patriotic Americans should understand that Putin is not America's friend, and he is not the President's buddy. We should stand united against Putin's past and planned future attacks against us." House Minority Leader Nancy Pelosi, D-Calif., said it would be "pointless and dangerous" for the U.S. president to meet with his Russian counterpart. She said it "must be canceled. ... Due to your constant expressions of sympathy for Vladimir Putin, your conflicts of interest, and your attacks on our closest allies, we do not have confidence that you can faithfully negotiate with the Russian leader." Pelosi had earlier said that the stakes for the meeting "could not be higher" and that "failure to stand up to Putin would constitute a profound betrayal of the Constitution and our democracy." Rep. Debbie Wasserman Shultz, D-Fla., said the DNC "the first major target of the Russian attack on our democracy." She tweeted: "I strongly believe that every individual who helped carry it out – foreign or domestic – should be held accountable to the fullest extent of the law." Wasserman Schultz had resigned as head of the DNC before the party's national convention in 2016 as a result of fallout from the contents of hacked DNC emails. See how others responded to the indictments. The Democratic National Committee was the first major target of the Russian attack on our democracy, and I strongly believe that every individual who helped carry it out – foreign or domestic – should be held accountable to the fullest extent of the law.